The Rainbow Lake triple deck commercial play structure is the flagship of the UPlay Today™ line and is designed to accommodate 20–30 children ages 5-12. The Rainbow Lake’s linear configuration is a great solution for a longer, narrow play space. For ground-to-deck access of the 6 foot Tower, the Rung Climber is featured. Rainbow Lake also includes both a 4 foot straight slide and a 4 foot curved slide. Kids will also love the thrilling ride down from the Tower on the 6 foot Wave slide. Decks are connected by a choice between either a Crawl Tunnel or Bone Bridge. Above the decks, the Ship's Wheel steering panel and "Window on the World" lookout panel are featured. Deck height: 4’ & 6"
Below the decks, kids can spin the Rain Wheel or strike up a rhythm on the Bobaloo drum or Bongos. The UP & Away is available in either the Playful or Natural color palettes. 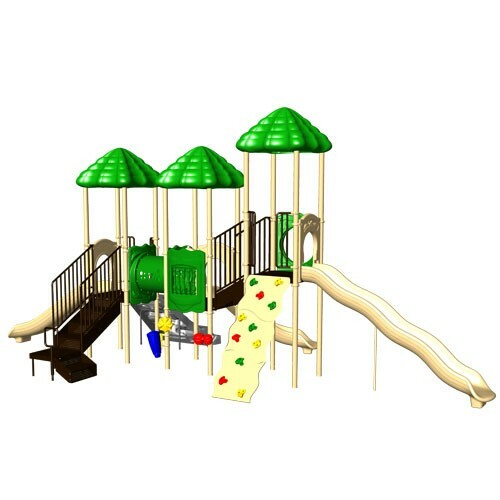 The Rainbow Lake play system meets ADA guidelines and is commercially compliant with ASTM & CSPC. IPEMA certified. The Rainbow Lake features powder-coated steel posts, coated steel decks and rotomolded and blow molded plastic components. The Rainbow Lake is the perfect easy-install, commercially compliant and budget-conscious solution for day cares, churches and apartment complexes! Assembly required. Truck delivery.